For the first time this postseason the Yankees finally held a series lead and looked to capitalize on it, to punch their ticket back to the World Series for the first time since 2009. The Yanks sent out young ace Luis Severino to face Justin Verlander and the Houston Astros in a decisive game six. The last time the Bombers face Verlander, the righty threw an immaculate 121 pitch outing in a 2-1 Yankees loss to Houston. After an early pitching battle, the Astros lineup roughed up Sevy in the fifth to grab a 3-0 lead. The Yanks would squander too many opportunities and lose 7-1, forcing a game seven tomorrow. Brett Gardner started the game with a leadoff single over the shortstop Carlos Correa, and with Aaron Judge up to bat, the Yanks would love to strike first in this game. However, Judge would ground into a 6-4-3 double play to put a damper on those hopes. Didi Gregorius popped up to Correa to end a ten pitch inning for Verlander. Severino answered for the Yankees, retiring the Astros in order in a 12 pitch bottom half. In the second, catcher Gary Sanchez hit a weak ground ball to third but hustled enough to squeeze out an infield single, bringing up Greg Bird. The lefty saw one fastball, a swinging third strike, to bring up Starlin Castro up to bat. The second baseman swung at the first pitch he saw for a deep fly ball for the second out of the inning. The switch-hitting Aaron Hicks would strike out on four pitches to end the inning for the Yankee batters. Severino once again answered the bell, with a four-batter inning with a walk for the young ace. Chase Headley would put a third consecutive inning with a baserunner for the Yanks, singling up the second base gap with one out. Gardner continued the trend of Yankee batters swinging on the first pitch, flew out to left-center field for the second out. Judge would end the inning on a three-pitch swinging strikeout. With all the talk this heading into this game about Verlander, it was Severino with the gem early in the game recording two strikeouts and one walk through three innings. However, the Bombers bats were cold, three hits but no runs through four innings. The Astros finally recorded a hit in the after three and two-thirds, with a Carlos Correa single. Severino would quickly end the inning with a pop fly to end the inning. Verlander continued his impressive outing, retiring the Yanks in order again for the second straight inning. Come the bottom of the fifth; things started to get dicey for Severino and the Yanks. A leadoff walk, a 4-3 groundball, and another walk brought up former Yankee Brian McCann with one out and men on first and second. The lefty-hitting catcher ripped a 1-2 pitch off the right-field wall for a ground rule double to score the first run of the night. The trouble wasn’t over yet, after another four-pitch walk, the bases were loaded with only one out. After a JJ Reddick shallow fly ball, Jose Altuve came up to bat. The second baseman ripped a first-pitch slider just passed the outreached glove of Todd Frazier for two-RBI single, extending the Houston lead to three. That was the last pitch for Luis Severino as the Yankees called on Chad Green to get them out of the inning. Green forced an infield fly from Correa to end the inning, Yankees trailing 3-0. The Bombers needed to get going soon, and Headley started it off with a leadoff single, his second of the game. Gardner popped out on the next at-bat, bringing up Judge. The towering right fielder just missed on two fastballs to start off the at-bat, leaving him in an early 0-2 hole. Judge would strikeout swinging three pitches later, bringing up Didi with two outs. The lefty took the first pitch to left field for a two-out single, and the first time the Yankees had a RISP this game. Gary Sanchez looked poised to cut into the Astros lead, but a 3-0 check-swing groundout ended the threat. After a four-batter bottom of the sixth, Greg Bird hoped to start a rally for the Yanks. He would draw a walk off a 3-2 count, and then Castro reached first on an HBP to give the Bombers another first and second, but this time with no outs. Aaron Hicks would force a 3-0, and the luck started to change for New York. A looking strike down the middle and then a very questionable called strike put the count full. The centerfielder fouled a few balls and then struck out swinging on a slider, bringing up Frazier. The third baseman sent a missile to center field, but a leaping catch by George Springer forced the second out. Headley then grounded into the shift to end the inning. Another quick inning for Chad Green brought up the top of the order for the Yanks. Verlander would not return for the eighth with Brad Peacock coming in for relief. After a great catch in foul territory by left fielder Marwin Gonzales, Aaron Judge sends a moonball over the centerfield wall to cut the Astros lead to two. Didi Gregorius popped up for out number two, bringing up Sanchez to the plate with two outs. The right-handed slugger would strikeout looking to end the inning. 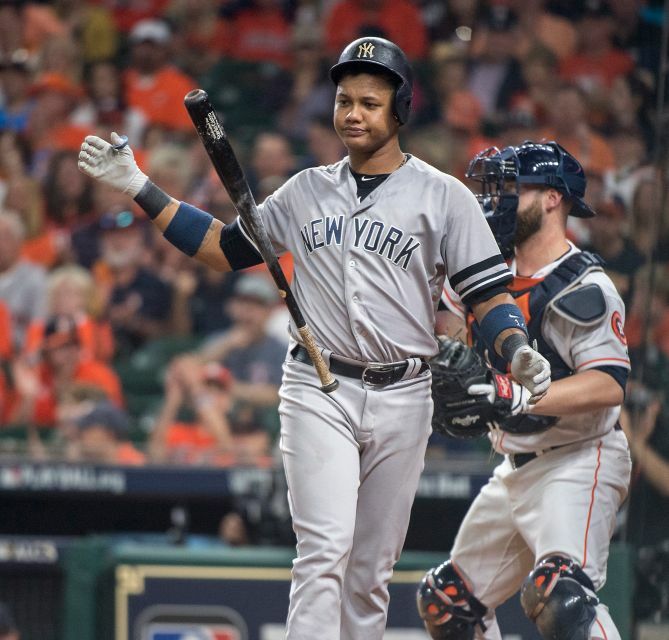 The bottom of the eighth was a disaster for the Bombers, David Robertson came in relief for Green and let up three runs off an Altuve HR and Alex Bregman double, prompting Joe Girardi to go to struggling Dellin Betances to finish off the game. The righty surrendered an inherited run on a sac fly but would finish off the Astros lineup with four batters. The five, six, and seven hitters were the Yanks last chance for a comeback. Bird flew out to right, Castro reached on an outfield single, and Aaron Hicks forced a 3-2 walk. Todd Frazier popped out to left, bringing up Chase Headley as the Yankees last out, the DH would strikeout to end the game. Severino looked great to start the game, allowing no hits through almost four innings, but a disastrous fifth did him in. Three walks, two hits, and three RBIs would let the Astros jump out to a seemingly insurmountable lead in the fifth. The issue for the young righty stemmed from his fastball control, one of his more dominate pitches, but tonight the fastball leaked a bit high, letting the Houston hitters lay off the inconsistent pitch. The Astro’s lineup would instead focus on his off-speed pitches for hits, and they would take advantage of that, with both of the RBIs coming off sliders. The Astros force a game seven, but this time without their aces Verlander or Keuchel. The Yankees will send out CC Sabathia to in another do or die game for the Yanks. The veteran lefty last pitched a six-inning shutout gem in game three of the ALCS in the Bronx. The Bombers are obviously undefeated in elimination games this year and need to continue that form tomorrow or they will watch the Fall Classic at home.